With more vehicles on the road and ever dwindling natural resources, there is a renewed focus on safety and energy conservation. Braking systems may have lagged behind other system development, but they’re now being thrust into the spotlight. With several OEMs already offering Autonomous Emergency Braking as standard, or as an option, Michiel van Ratingen, the Secretary General of Europe's New Car Assessment Programme (Euro NCAP) has announced: "We don’t want to force them [car makers] into this [mandatory fitment] immediately, but we’ve made it very clear that the best way to ensure a five-star rating from 2014 is to have AEB on the vehicle." It’s estimated the mandatory fitment of AEB could reduce road traffic accidents by 27 per cent, saving some 8,000 lives, whilst saving the economy between €5 billion and €8 billion a year. Using these technologies Mercedes Benz have creatively adapted and integrated several systems to produce the "Pre Safe", "Attention Assist", "Active Lane Assist" "Distronic" and "Active Blind Spot Assist" safety systems. 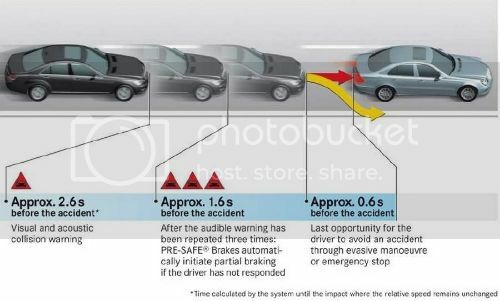 All of these integrate the braking system to either slow the vehicle down (as in the Pre Safe and Distronic aids), or steer the vehicle by braking wheels on the same side of the vehicle. Volvo has just launched their "Pedestrian and Cyclist Detection with full auto brake" system using dual-mode radar allowing a wide field of view to accurately detect pedestrians and cyclists. Coupled to a high-resolution camera fitted in front of the rear-view mirror the system identifies the type of object detected by the radar and calculates their pattern of movement, before flashing a red warning on the windscreen and thereafter activating the auto brake system. As the number of Hybrid and Electric Vehicles on the road increases so will the demand for refinement and operating noise reduction. Hydraulic-by-wire systems, like Continentals MK C1, provide the ideal "power on demand" braking using a pulsation-free linear pump with a much lower noise emission level than in conventional solutions with ESC multi-piston pumps and the electric vacuum pumps that are often required. This solution is particularly applicable in electric vehicles with a lack of "noise cancellation" from a combustion engine –this will be available starting in 2015, as a "Premium Compact" braking system. Although not specifically aimed at AEB, Bosch have just unveiled their iBooster: A brake booster that in the near future will replace the conventional unit. The Bosch booster enables a much faster emergency stop and makes hybrid and electric vehicles more efficient. The iBooster, is an electromechanical brake booster that is electronically operated and does not require any vacuum from the engine or a vacuum pump. That in itself is an aspect of weight reduction and thus reduction of fuel consumption and CO2 emission. During an emergency stop, brake force is added by the iBooster and brake pressure is built up fully autonomously in some 120 milliseconds. This is three times faster compared to a conventional brake booster. The iBooster has been especially developed for hybrid and electric vehicles that often cruise on the motorway or that drives in electric mode for many miles and consequently do not regenerate much energy from braking. With existing technology capable of providing effective AEB the primary challenge will be to reduce cost. For AEB to really achieve the projected objectives it needs to be fitted to smaller, cheaper vehicles where cost is critical. AEB is but one step on the path to the fully autonomous driving experience. Companies such as BMW, Google and VW have all created working prototypes incorporating technologies such as "Car to Car" communication and GPS positioning to guide vehicles autonomously. Building safer vehicles has always been one of the pillars of automotive development, but only recently has the braking system been employed to make them more fuel efficient and environmentally friendly. These systems are well known in Hybrid vehicle applications where the kinetic energy, converted under braking, is stored in battery packs. But it’s important that Kinetic Energy Recovery Systems are fitted to vehicles not equipped with Electric drive. This requires a whole new set of technologies. Recently, companies such as the Schaeffler Group and Protean Electric have unveiled in-wheel drive systems that take the concept one step further: Using an electric motor in each driven wheel, the components required for drive, deceleration and driver assistance are all installed in the integrated wheel hub drive. • Highest torque density of any of today's leading electric drive systems. • 75 kW (100 hp) peak power and 1,000 Nm (735 lb.-ft.) peak torque in each motor. • Mass of only 31 kg (68 lbs.) per motor. • Fuel economy improvements up to 30 percent in hybrid configurations, as compared to the existing vehicle, depending on battery size. • Superior regenerative braking capabilities, which allow up to 85 percent of the available kinetic energy to be recovered during braking. With all the building blocks available, it’s not difficult to see how integrating systems can lead to enhanced driver experience and improved vehicle functionality. Fitted to BMW’s ActiveHybrid, the Intelligent energy management system works with the vehicles "Navigation system Professional" to provide consumption and emission-reducing performance. Based on navigation data, the Route-ahead assistant calculates the upcoming driving situation and prepares the vehicle systems accordingly. The vehicle then automatically adjusts to route-specific elements like ascending slopes, downward slopes or speed limits and selects the optimum time for purely electric driving. Although these systems are very effective in regenerating and storing the kinetic energy for electrical power generation, the vast majority of vehicles produced (in the foreseeable future) do not have any form of electric power. The storage system chosen for mechanical drives is the flywheel. 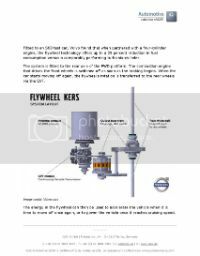 There are several KERS systems available, utilizing different transmission systems to transfer the energy to and from the flywheel. Many OEM’s have chosen to follow the Flybrid concept in their initial development. Having followed a similar route with their "Flywheel KERS" system Volvo have achieved promising results by using an experimental carbon fiber flywheel spinning at 60,000RPM in a vacuum, while weighing 6 kg and measuring about 20 cm in diameter. The engine is augmented with a 60 Kw boost, resulting in acceleration comparable to six-cylinder performance – 0-100 km/h in 5.5 seconds. Fitted to an S60 test car, Volvo found that when partnered with a four-cylinder engine, the flywheel technology offers up to a 25 percent reduction in fuel consumption versus a comparably performing turbo six-cylinder. The system is fitted to the rear axle of the FWD platform. The combustion engine that drives the front wheels is switched off as soon as the braking begins. When the car starts moving off again, the flywheel's rotation is transferred to the rear wheels via the CVT. The energy in the flywheel can then be used to accelerate the vehicle when it is time to move off once again, or to power the vehicle once it reaches cruising speed. 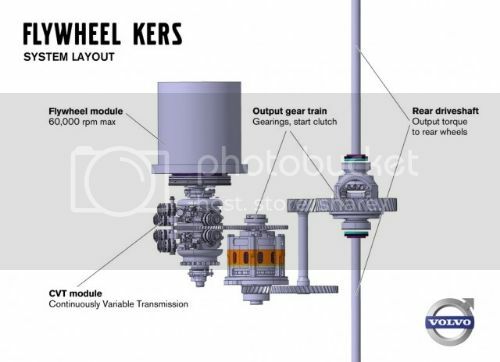 Choosing a different approach, the Cambridge CPC-KERS uses a simple differential gear system distributing torque between engine, flywheel, and road wheel. With this system a 50%-70% lower unit manufacturing cost, over CVT equipped systems is claimed. The design also makes it feasible to retrofit this to existing vehicles. Ring gear 401 is driven by the "motor" through the pinion wheel. If the side gear 301 is locked relative to the differential case, all the torque is transferred through the side gear 301 and transmitted to the "wheel" on shaft 401. During braking or descent, torque from 401 can be transmitted through the differential case gearing system 201 to the flywheel 501. The vehicles kinetic energy is thus transferred to the kinetic energy of the flywheel. 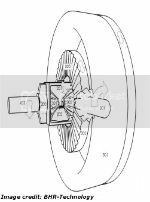 This energy is then available to be transferred through the differential case gearing system 201 from the flywheel to the wheel 401 again; using, for example a friction brake to distribute the torque. • Drivability – The transition from storing to releasing the energy needs to be flawless. • Hardware cost – when fitted to lower cost, mid to small vehicles. • Packaging –especially in the case of the CVT, can make fitment difficult. These advancements in braking systems align perfectly in the greater picture of an autonomous drive vehicle that leaves an ever diminishing footprint on the environment. While the integration of various systems have enabled these developments, this in itself adds complexity and cost to the testing, verification and homologation of the braking system. Cutting across all traditional vehicle domains; power train, chassis, body, telematic, and multimedia and Human Machine Interface, new protocols will need to be developed as will engineering standards and safety definitions. The ultimate challenge the industry faces in bringing this to mass production, is cost. Even the potential production volumes won’t be sufficient to drive the costs down without component level technology. Continental Chassis and Safety press release "The Future of Braking"
-The AutoChannel – quoting Bosch Automotive Group, chairman Dr. Bernd Bohr. -Mercedes Benz cars – safe brake. Can We Improve Road Safety Without Removing the Driver?